New labels and icons are in place for the groups of similar entities: domain objects, controllers, views, etc. However the biggest change is the new plugins folder. 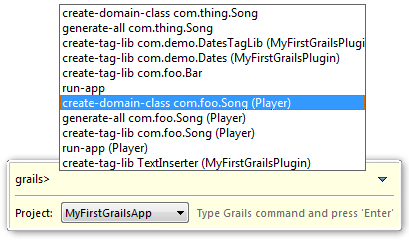 Previously when working with a grails project the plugin dependencies were tricky to see in the UI, being hidden in the classpath container and via some Eclipse linked source folder entries. 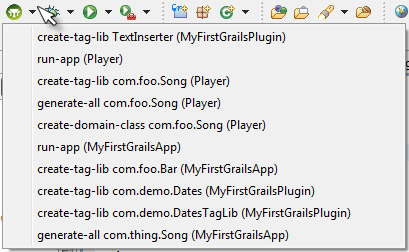 Now in the project explorer it is much more obvious what the application dependencies are. 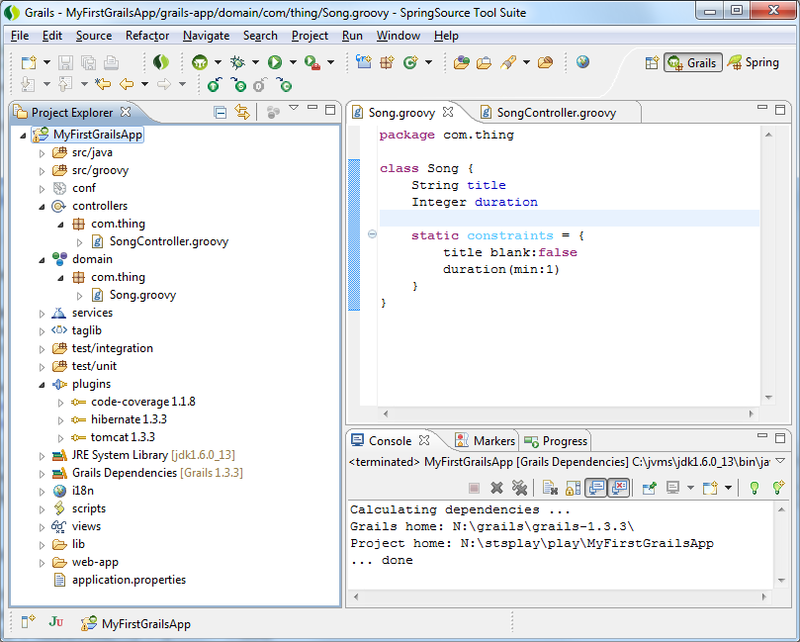 After specifying that dependency and running a ‘Refresh Dependencies’ against the application, the ‘plugins’ folder has updated (see the above screenshot) with a new entry for my new dependency and a different kind of icon which indicates that it is a different kind of plugin dependency. It also provides the detailed descriptions and any available links to documentation. The list of available plugins is cached but you can press Refresh to ensure you are working with the latest list. By default the manager is showing you all available plugins, but as you scroll down you will see what you already have installed (installed plugins have a green tick against them). Importantly if any of the installed plugins have had an update released, the UI will indicate that to you and you can update if you wish (a blue up-arrow icon indicates an update is available). Due to the act of installing/uninstalling a plugin not being instantaneous (it takes a few moments for grails to actually do it), as you interact with the UI and mark plugins for install/update/etc you are basically scheduling a series of grails commands to run. The changes you have requested won’t actually execute until you press the OK button to close the manager. If at any time you think you’ve messed up you can cancel the manager (or reset the manager) and your project will be in its original state. 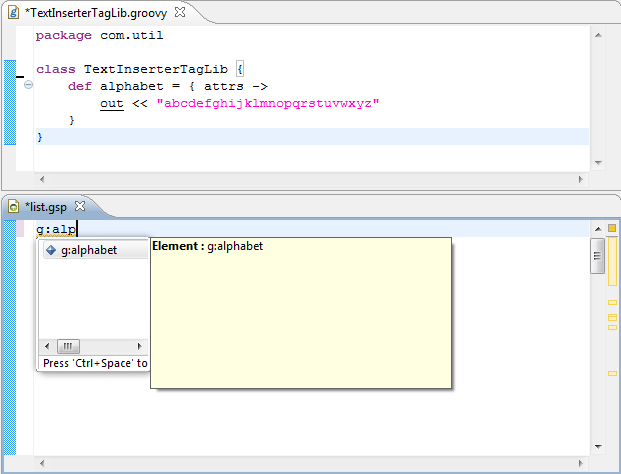 Here you can see I have a new taglib called TextInserter defining a tag alphabet, in the gsp editor I can code complete on that tag. (following the current model for jsp editing, the code assist Ctrl+Space must be performed prior to typing). 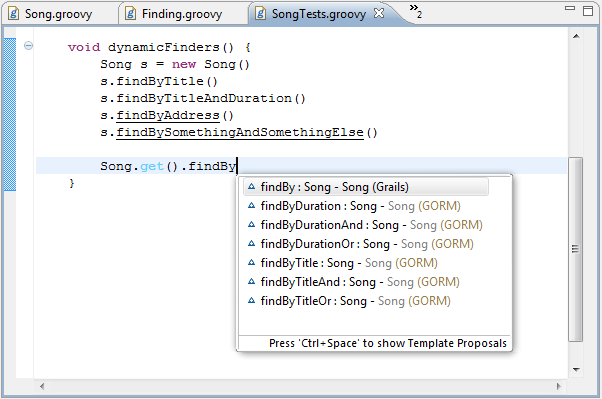 Here you can see against my Song object (which only has a title and duration) any attempt to use invalid finders is marked with underlining in the editor, and code assist is providing the valid choices. Any feedback is appreciated. Improvements to debugging is something we are going to be looking at in the near term, but if you wish to raise new requirements on comment on existing issues, please see the STS issue tracker.